On Friday, Creative Capital picked up a nice review in Mass High Tech, a weekly publication covering business news of the New England high tech industry. MHT claims to be the largest regional technology publication in the country, with a circulation of 18,000. With the relentless flow of bad-to-worse to even-worse business news in 2008, it is perhaps not surprising that two new books with regional relevance avoided the limelight last year. For Mass High Tech readers, though, they should be of special interest. One is a memoir from the indomitable Leo Beranek (the second B in BBN Technologies, the company that helped build and run the ARPANET) spanning his Iowa farm boy childhood in the era of the Model T — he is 95 — up to his continued role as a 21st century acoustician. Then there is Creative Capital: George Doriot and the Birth of Venture Capital by Spencer Ante (Harvard Business School Press, 2008), the long-overdue biography of the Frenchman who set down roots in Boston and, among other accomplishments, pretty much invented the modern venture capital industry. Muy Bien: Creative Capital Lands in the Dominican Republic! This just in: My book is finding readers in the DR!!! Muchas gracias Marcelle!!! I am a accounting student and my thesis was about Venture Capital. I have to confess that in my country (Dominican Republic) this topic is unknown. By the way I got excellent grades on my project. I bought your book and it is wonderful. I could know a lot of details about Georges Doriot. Thank you very much for writting that great biography! I got a few more pictures from the book party. Some are from HighBar and others are from the after-party when a bunch of us headed uptown and went to the Bear Bar to help shut down that Upper West Side institution. In case you can’t tell, the Bear Bar is the divey looking place with the wood paneling that was prevalent in suburban basements during the 1970s. Today, The Creative Group, a professional staffing company that specializes in placing skilled folks in advertising, marketing, web and public relations industries, ran an interview with me about Creative Capital in their online pub eZine. In the Q&A, we talked about a number of relevant issues for today’s creative class, such as what traits make a person successful, and how organizations can promote creativity and risk-taking. Here’s the intro and first question and answer. Check out the rest of the interview here. 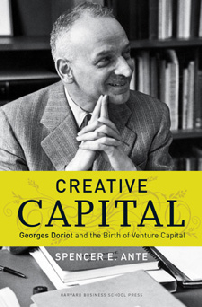 In Creative Capital: Georges Doriot and the Birth of Venture Capital, Spencer E. Ante tells the compelling story of the quirky and charismatic man – Georges Doriot – who created the venture capital industry. Through tracing the pivotal events in Doriot’s life, Ante paints the picture of a man who overturned conventional wisdom and achieved extraordinary success by relentlessly pursing what-if possibilities. The book has received positive reviews in the Financial Times, The Wall Street Journal, The New York Times and other places. Spencer Ante: “For one, Doriot was incredibly ambitious from a very young age. He was inspired by his family and friends to achieve the best. My book opens with a story where Doriot runs home to show his parents a certificate he got for placing second in his class. While his mother congratulates him, his dad asks, ‘Why not first?’ – the moral being that it wasn’t important that his son come in first, but that he shouldn’t settle for less than the best. Doriot was influenced by this event for the rest of his life. “Doriot was also an incredibly hard worker. He grew up during World War I and his family was quite devastated. This gave him a sense of hard work and the understanding that you don’t get something for nothing. “Finally, he had a sense of creativity and was one of the first people in the industry to recognize the value of creativity – trying to do something different. He was a big believer in the power of design in life and business, and recognized, well ahead of his time, the role design plays in how people interpret and value the world. As promised, here are a few pics from the party. I will probably throw up a few more when they come in over the transom. Dan Schawbel, operator of the Personal Branding Blog, yesterday recommended my book along with a few other titles. Check out his blog and review by clicking here. I’ve been told repeatedly that young people no longer read books. Perhaps Dan’s plug of Creative Capital will prove them wrong! Just got a nice and new review today on Amazon.com from a prolific reviewer named Serge J. Van Steenkiste. Spencer Ante sheds a powerful light on the life and accomplishments of a foreigner who came alone to the U.S. in 1921 C.E. That man had neither family nor friends at his arrival. Furthermore, he never graduated from college in his native country. On top of that, that man was not rolling in money. The WWI had wiped out his father financially. However, that foreigner had some assets: a strong Protestant work ethic, a passion for technology and the future, a confident yet humble personality that was at ease with people of all stations in life, a strong volubility, a sense of compassion, and a deep understanding of the importance of education. Furthermore, that same foreigner wanted to run one day his own company after the example of his father. 4) And last but not least, the father of the venture financing industry as we know it today around the world. That foreigner was a Frenchman and his name was Georges Doriot. As it is often the case, an extraordinary woman, who remained mostly in the background, was part of that story. Her name was Edna Allen and she was American. To summarize, Ante succeeds in bringing back to light a man whose contributions deserve to be better known, especially, in business circles.